And The Oscar Goes To: Faster Chakram, Kill, Kill! Promo cover for SHAKESPEARE IN LOVE. Hollywood comes to Ancient Greece! It was certainly no coincidence that THE PLAY'S THE THING (85/417), about a bunch of kids trying to put together a show on the Great Appian Way, came out a few days before the Oscars. 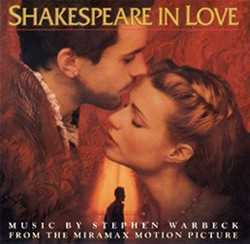 The parallels to Shakespeare In Love (John Madden, 1998) are many and are not coincidental. This year, the strong favorite to win the Oscar for Best Picture was Saving Private Ryan (Steven Spielberg, 1998), a shattering and frequently devastating look at war. Perhaps overlooked was a genre that has not been seen for a long time: the happy little story set in the past, a long, long time ago. Shakespeare In Love had wonderful characters and very clever writers (Tom Stoppard and Marc Norman). The director, actors, and producers endowed the movie with a sense of brightness, as well as a certain playful attitude. Both Shakespeare In Love (henceforward referred to as Shakespeare ) and THE PLAY'S THE THING (henceforward referred to as PLAY ) gave frequent winks to the audience and numerous nods to the present. It is always fun for the audience to pick up little references hidden in a show. PLAY and Shakespeare share the use of many references, both contemporary and anachronistic, done in a humorous vein. Contemporary references in Shakespeare include visits by Shakespeare's contemporaries Christopher Marlowe and John Webster. Marlowe (author of Edward II , Tamburlaine I&II , and Doctor Faustus ) politely suggests changing the name of Shakespeare's new play "Romeo and Ethel, the Pirate's Daughter", and makes suggestions regarding the plot, such as, "Their families could be mortal enemies". A much more devilish picture is painted of John Webster [author of The Duchess Of Malfi , a play replete with graphic violence, and The White Devil ), who is shown being cruel to a small animal, and when asked by Queen Elizabeth, another Shakespeare contemporary, what he thought of the play, responds, "I liked when she got stabbed!" Contemporary references in PLAY (a very broad term indeed, the way the Xena time line runs) include even the title, drawn directly out of Shakespeare's Hamlet . It is certainly no stretch to have references to both the Bard and Sophocles in the same show. At one point, seeking reaffirmation of the importance of artistic integrity, Gabrielle drops in on a rehearsal of Sophocles' new play, only to find a Ziegfeld Follies-like dance number and a video game-violent fight scene. What about the anachronistic references in Shakespeare ? The authors snuck in many subtle references to present-day Hollywood. As a lovelorn Shakespeare uses his most flowery language to win over Gwyneth Paltrow, their boatsman rolls his eyes and moans, "Oh, a writer, eh?" Things do not go any better for Will, and a few minutes later, the boatsman pulls out a manuscript he has been working on. "Strangely enough, I happen to be an amateur writer myself". Later, when it looks as if the show will be canceled, a stuttering character actor tries to tell Shakespeare, "The show m-m-must...," and Shakespeare finishes, "Go on?" Where to start with the anachronistic references in PLAY ? First, the show pays direct homage to Mel Brooks' film, The Producers (1968). In The Producers , they are producing a "sure-flop" play called Springtime For Hitler . Mel himself would no doubt approve of the Xena update. Perhaps, even closer to home, is the pattern of having an action adventure show "decompress" every so often with a comedic break. This certainly owes a lot to the Original Star Trek (TV, 1966-1969) episodes I, Mudd and The Trouble With Tribbles . There are plenty of very Shakespeare references to 1999 as well. Gabrielle's new show is called "Faster Chakram, Kill, Kill! ", after the famously low-budget Russ Meyer movie. Another show in town is called "Buffy the Bacchae Slayer", a not so subtle homage to Buffy The Vampire Slayer . One of the actors in Gabrielle's piece is named Dustinus Hoofmanus, and he is quite the "Method Actor". A definite fan favorite which references the show Xena: Warrior Princess itself is when Minya, holding hands with a tall girl dressed as Xena, gives the now-classic line, "I'm a thespian!" (One touch I would have liked to seen would have been to also have Minya dressed as Gabrielle). In the last scene in the show, Ted Raimi is trapped hanging upside down, and calls out, "Hey, get me down, I'll call my brother!!". Most viewers will know that Joxer's brother is actually a powerful and unscrupulous rogue named Jett, but some viewers will also know that Ted Raimi is the brother of XWP's executive producer, Sam Raimi. Both references were undoubtedly intended. Bill Murray in SCROOGED formal attire, suitable also for Academy Awards. Interestingly, the world's greatest expert at picking the Academy Awards winners remains Bill Murray. Murray used to pick the winners as a part of the news broadcasts on Saturday Night Live back in the 1980s, and he has almost never been wrong. He first caught my attention when he predicted Marlee Matlin to win for Children Of A Lesser God (Randa Haines, 1986). Why Matlin? Said Murray, "Because she's deaf!" Although he has been absent from Saturday Night Live for some time, I was very happy to see him back before the Oscars. Although he correctly picked Shakespeare for best picture and Gwyneth Paltrow for Best Actress, he failed to pick the sedate and understated Roberto Benigni. This did not surprise me. I also was off-target for Best Actor because year after year I pick Bruce Campbell to win for his indescribable fight scene with his own right hand in Evil Dead 2: Dead By Dawn (Sam Raimi, 1987). If you have not seen it, go rent it now! It is the most amazing solo fight scene in the history of cinema, bar none. There were parallels between the 1998 Oscars and XWP as well. Both Xena: Warrior Princess and The 1998 Academy Awards featured "THE CONTROVERSY!" In the case of the Oscars, The Academy decided to grant its highest lifetime achievement award to some old guy (Elia Kazan) who had ratted on friends and colleagues to the Communist Witch Hunt committees in the 1950s, blacklisting them and effectively ruining many careers. In exchange, Kazan got off scot-free, and many years later, got a nice golden statue to put up at home for his trouble. In the case of Xena: Warrior Princess , some members of the Hindu community were outraged at the producers for daring to portray Lord Krishna consorting with "known lesbians" (to wit, Xena and Gabrielle). I agree that this is a most egregious miscarriage of justice, but it is one that can, I believe, be remedied by Sam Raimi and Rob Tapert. I think Lord Krishna should be given his own action-adventure show. With his beautiful long hair and lovely blue face, it could be called 'Krishna: Warrior Princess'. The moral of all this is that Xena and Hollywood go together. Beginning with the often uncentered third season, XWP has shown that while it is, at times, very uneven, it can still be the most enjoyable story-telling around. This implies one thing to me: it is time for XWP to make a full-length motion picture, and not a half-*ssed Kull The Conqueror (John Nicolella, 1997) clone either. They can take their time and do it up right - perhaps something like The X-Files (TV, 1993-1999) producers did with their movie [ X-Files: Fight The Future (Rob Bowman, 1998)], tying it into the series' season finale. In the case of Xena , however, the producers could make it the REAL finale. Make the movie the last Xena ever: Butch and Sundance, Thelma and Louise, Xena and Gabrielle. I can picture them in the Elysian Fields, laughing at everyone still trying to figure them out, but with no one ever really understanding. Now, there's a movie! Back to the beginning, two tiny amoebas, the STAAAAAAART of Life!... I was born and raised in Pittsburgh, a burgh full of some of the most beautiful and friendly people around, where there is a really high value placed on tolerance and helpfulness. I also lived in Belgium for a while growing up, and after high school I went to Alaska, the most beautiful place on Earth, for three years. Now I am a hard-working young surgeon, done with Residency (or "The Other Side," as we call it). My beautiful wife and I (and a new small human on the way) are moving back to the Pacific Northwest, to a little seaside town on the Oregon/California border. In short, I'm a very lucky guy. Favorite line: I remember really howling at something (actually, many things) Autolycus, the King of Thieves says in THE QUEST (37/213), "durned" if I can remember... (I got to see that one again sometime...) Xena says, "Tell Hades to get ready for a lot of dead bodies!! ", but I don't exactly remember [ DESTINY (36/212)]. So, I'll say, "I don't need a Solstice present, you are a gift to me, Gabrielle." (Xena, in A SOLSTICE CAROL (33/209). That was so cute. Least favorite episode: I guess the episode I liked least (although I still liked it some) was A NECESSARY EVIL (38/214). It's like ANYONE can become a god, or Immortal, get death rays or some ultimate power-deal. Anyone can p*ss on people, kill Amazons, threaten and try to kill your closest friend, and there's really no accounting or remorse; and they all come back eventually in a later episode!